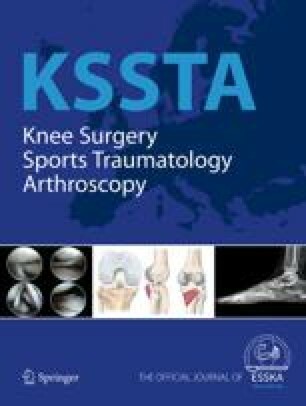 The objective of this study was to determine the effects of sectioning the posterolateral structures (PLS) on knee kinematics and in situ forces in the posterior cruciate ligament (PCL) in response to external and simulated muscle loads. Ten human cadaveric knees were tested using a robotic/universal force-moment sensor testing system. The knees were subjected to three loading conditions: (a) 134-N posterior tibial load, (b) 5-Nm external tibial torque, and (c) isolated hamstring load (40 N biceps/40 N semimembranosus). The knee kinematics and in situ forces in the PCL for the intact and PLS-deficient knee conditions were determined at full extension, 30°, 60°, 90°, and 120° of knee flexion. Under posterior tibial loading posterior tibial translation with PLS deficiency increased significantly at all flexion angles by 5.5 ± 1.5 mm to 0.8 ± 1.2 mm at full extension and 90°, respectively. The corresponding in situ forces in the PCL increased by 17–¶19 N at full extension and 30° of knee flexion. Under the external tibial torque, external tibial rotation increased significantly with PLS deficiency by 15.1 ± 1.6° at 30° of flexion to 7.7 ± 3.5° at 90°, with the in situ forces in the PCL increasing by 15–90 N. The largest increase occurred at 60° to 120° of knee flexion, representing forces two to six times of those in the intact knee. Under the simulated hamstring load, posterior tibial translation and external tibial and varus rotations also increased significantly at all knee flexion angles with PLS deficiency, but this was not so for the in situ forces in the PCL. Our data suggest that injuries to the PLS put the PCL and other soft tissue structures at increased risk of injury due to increased knee motion and the elevated in situ forces in the PCL.